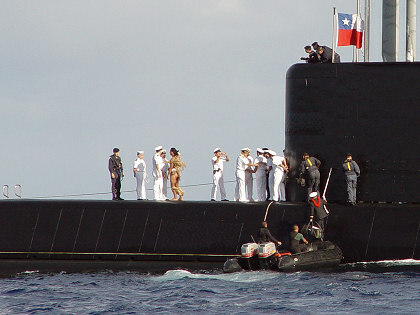 An interesting show takes place on the sub's foredeck. A while later, I was in the cockpit idly watching the activity and saw the rugged-looking pilot/rescue boat Tokerau come out from shore. Several people climbed from the pilot boat into the sub's dinghy and were ferried to the sub. 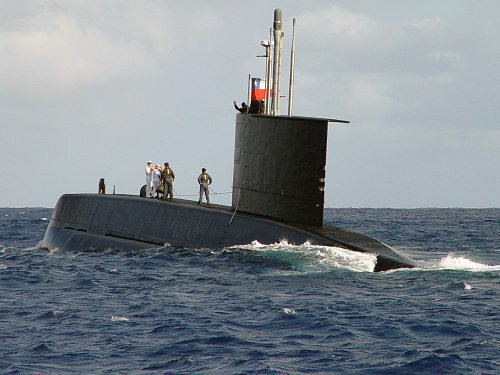 They climbed up rungs on the hull to reach the sub's narrow deck and were greeted by people from the sub. Most of the boarding party wore dress white uniforms, but one person was strangely attired. At first, I though it was a woman wearing a skimpy feather costume, but the person began to jump and twist around and shout, all while standing on the narrow deck surrounded by officers and crew. I could tell from the person's voice that it was a man, and deduced that it was a traditionally-attired Rapa Nui native performing a welcoming dance for the sub. 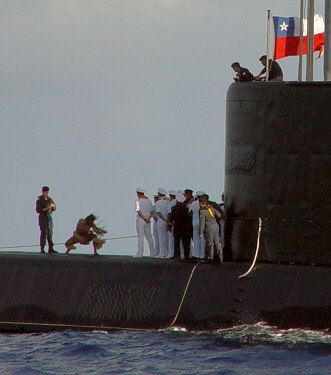 After his brief but highly unusual performance, the sub's people applauded and the performer returned to shore. Meanwhile, we were just sitting in our cockpit, taking in the spectacle. Altogether we snapped lots of pictures, but I guess they didn't mind since nobody told us to stop. With all the dramatics over, things returned to normal on the sub and Nine of Cups. David did some chores like changing the engine oil, etc. To our surprise, later in the afternoon, the submarine called us on the radio and invited us over for a visit later in the evening, to be received by the captain. We were flabbergasted—it was already amazing enough to have a submarine anchored next to us, but now to be invited aboard to be received by the captain, frankly that was over the top. We were so excited; this was something so out-of-the-ordinary and unexpected that we were just ga-ga. We were invited for 8:00 p.m., after the day's work was done and they were no doubt done with their evening meal. At this point, we didn't know whose dinghy would be used, theirs or ours. Their dinghy was inflatable but big and sturdy with twin engines, so it would be nice if they could pick us up. But we wouldn't find this out until later when our visit was coordinated at the last minute. So, in the last light of daylight, David climbed into our dinghy and bailed it out and pumped it up. We hauled it up to Nine of Cups' stern quarter and lowered the outboard motor from the stern pulpit. The whole time the sea was very bouncy. The wind had picked up during the day and there had been frequent squalls with strong winds and occasional pelting rain. By evening the sea was very choppy and confused, with pronounced wind waves and swell from two directions, plus frequent small whitecaps. Frankly, I was pretty anxious about riding in our dinghy over the choppy seas in the pitch black night. It was only a short distance, but it would be rough and we would get wet. So here we were on Nine of Cups, dressed and waiting for our 8:00 p.m. reception on the submarine. It would be completely ordinary to be invited over to another cruising boat, and quite unusual to be invited on to a commercial vessel. It would be even more unusual to be invited aboard an active-duty military vessel, and basically unheard of to be invited on to a foreign submarine to meet the captain. Finally, 8:00 p.m. rolled around. We were all ready, and had been for some time. 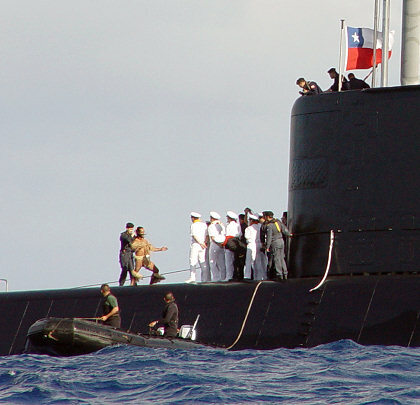 We anxiously awaited the last-minute call from Francisco on the submarine. As time passed and we heard nothing, we casually joked about the South American standards of punctuality. Finally, at nearly 9:00 p.m., Francisco called on the radio. He was extremely apologetic, but said the captain had been delayed in Hanga Roa and unfortunately wouldn't be able to receive us tonight. Therefore, he said, our visit would have to be rescheduled for tomorrow. Although we were all disappointed, frankly I was relieved we wouldn't have to take the dink out on a night like this. We quickly changed back to our shabby cruiser clothes, and shortly thereafter, went to bed. After all, our usual bedtime is around 8:30 p.m., and it was now scandalously late—after 9:00 p.m.